A beautiful graphic biography, aimed at readers 8 and up, about one of my favorite artists, Emily Carr. Nicolas Debon traces Carr's life through her paintings. The drawings and text lovingly depict the artist, the places and times she lived in. Emily Carr was an extraordinarily gifted artist and she is all the more remarkable for being one of the very few women painters of her time. In the face of many challenges she pursued her own vision, basing her work on her great sense of curiosity and respect for the world surrounding her rather than on what was fashionable among artists of the period. From Nicolas Debon's introduction. Choosing four paintings done at different times in Carr's life Debon draws four brief chapters that illustrate Emily's determination and character. He even uses bits of her paintings as background and places her within them. Four Pictures is a beautiful use of the graphic medium and an affectionate tribute to a strong and gifted artist. This trade collects JLA 24-33, about a year's worth of stories. To me, this is a fairly average collection; nothing spectacular but not bad, either. First there is the story about the Ultramarine Corps where some of the military bigwigs have become distrustful of JLA and they want their own super humans. Of course, that story never ends well unless it's the origin story of the main team of the book. Then JLA gets a hot tip from T. O. Morrow that Professor Ivo is going to use Amazo to break himself out of prison. Then JLA and JSA team up against the threat of genies from the fifth dimension fighting each other on Earth. At the same time a forgotten founding member of JLA is getting his revenge. Finally, there’s a two-part tie-in to Batman's No-Man's Land story. The last two-parted was also a pretty weak effort. I haven't read No Man's Land but I've heard of it. This story felt like an excuse to readers who were wondering why JLA wasn’t doing anything. Batman should have been resentful about that. Over two decades ago, when DC was preparing the end the original run of Superman comics and re-launch the series beginning with a new #1 issue, legendary comic writer Alan Moore was approached to write the “wrap-up” of the series. That two-part comic, WHATEVER HAPPENED TO THE MAN OF TOMORROW? has become one of the most well-loved and well-known Superman comics ever published. Though considered by many as non-canonical, that story did bring an end to the Silver Age of Superman, much to the chagrin of comic fans around the world. Now fast forward two decades. Instead of Superman, DC decided to “kill” it’s other tent pole superhero, Batman. Seeming to have died towards the end of the “Final Crisis” series, DC approached Neil Gaiman to write a story to sum up the life and legend of Batman. Using Moore’s famous story as inspiration, Gaiman wrote BATMAN: WHATEVER HAPPENED TO THE CAPED CRUSADER? Now, I have to admit, I never liked Batman as much as I liked Superman and the Green Lantern. For many, Batman is a character they love because Gotham City is more like the real world than Metropolis and Batman is just an ordinary human with no super abilities. It’s for those very reasons, that I like Batman a little less that the Man of Steel or Hal Jordan. Superheroes should be super. That’s what makes them different. Still, even though he’s not my favorite, I still like Batman and do find him the most relatable of the major DC heroes. In WHATEVER HAPPENED TO THE CAPED CRUSADER? Bruce Wayne cannot be seen by people, but it becomes clear to him he is at his own funeral. Friends, comrades, and enemies all appear for the service. One by one they get up to tell their own stories about Batman & Bruce Wayne. None of the stories are the same. It’s not possible for most of these stories to be true. In fact, problem none of them actually happen. Yet, each of them provides a glimpse into the Caped Crusader and how he was viewed by allies, foes, and readers alike through a long and storied history. For Batman fans, WHATEVER HAPPENED TO THE CAPED CRUSADER? is a love letter. It’s filled with allusions to famous Batman battles, minor villains, and other Batman minutia that Batman fans or other comic book geeks will enjoy discovering. The artwork by Andy Kubert is gorgeous. It captures the essence of Batman; the shadowing of a dark and dreary world ripped from crime stories and film noir, yet touched and lighted by the elegance of the glow like that from the screen of an old cinema showing a classic Hollywood movie. It is danger seeped in nostalgia, longing, and lost innocence. Despite the original idea and the beautiful artwork, WHATEVER HAPPENED TO THE CAPED CRUSADER? is not a story that will appeal to many people. It’s very much tied into what is currently happening in the DC universe, e.g. the events of FINAL CRISIS and the current BLACKEST NIGHT storyline. Therefore, those who just have a general knowledge of Batman and the DC universe might be confused. Also, the story has a rather ambiguous ending. No one is for sure what is going to happen with Batman, but unlike the Silver Age Superman stories that came to an end with WHATEVER HAPPENED TO THE MAN OF TOMORROW?, WHATEVE HAPPENED TO THE CAPED CRUSADER? is not the final Batman story. Included with this Deluxe edition, are three other Batman comic Gaiman wrote: a Black and White story (where DC characters interact in the green room before appearing in their panels); a Poison Ivy story; and a Joker story. The great war between Fabletown and the mighty empire of the Adversary is over, and the victorious free Fables have brought their defeated enemy back from the Homelands to join them in exile. Their celebrations, however, are destined to be short-lived. As it turns out, not even beloved storybook heroes can escape the law of unintended consequences. In the post-war chaos of the Adversary's former realm, a terrible force is about to be unleashed - an evil that threatens not just Fabletown but the entire mundane world. 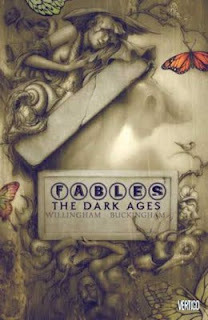 My review: I was a bit worried about how Willingham et al would keep the Fables story going after ending the big bad war in War and Pieces. My fears turned out to be completely unjustified, as this was an amazing (albeit sad) book and perfectly set up the next great arc in the Fables saga. Fair warning: SPOILERS to follow. I'll try not to give away the big ones, though. The book opens with Geppetto being escorted around Fabletown by Pinocchio, who's trying to get him adjusted to life after ruling the Empire. Not everyone is happy with the newest Fabletown resident, but I thought it was interesting to hear Geppetto's side of the story. He believed he was acting for the greater good, so sacrificing a few thousand lives was worth it, because in the long run he saved billions, or so he claims... Now that the Fables have taken him out of power, he believes the other worlds will suffer even more. Geppetto's warnings seem to have merit, though, as back in a recently-freed-from-the-Emperor-land a pair of marauders unknowingly release a very powerful new enemy. This new adversary wants revenge on the Fables for taking away his magic and using it themselves, and he means business. The Fables are forced to evacuate The Woodland and move upstate to the Farm after the magic spells holding their community together begin to crumble. Baba Yaga comes back, and although she didn't get to do much in this book I'm curious to see what havoc she'll wreck in the next one. Even Frau Totenkinder is scared! The main purpose of this book seemed to be setting up the new big bad and the next event in the Fables series: The Great Fables Crossover (with Jack of Fables, an offshoot of this series that I also really enjoy). The other big part of the story was the death of a character (one of my personal favorites) that brought up questions of what happens to the Fables when they die. We've seen some come back (there are always three little pigs, for example, and Snow White managed to survive a gunshot to the head), so I'm hoping this character will reappear at some point, too. But it was still an emotional arc and really made me question just how great a surgeon Dr. Swineheart is. He seemed like a bit of a pompous jerk, actually, but that could've just been me projecting because of the way he was treating said beloved character. There was also a smaller mini-story that dealt with Mowgli returning to a jungle world with Bigby's brothers that was a bit more light-hearted and I nice diversion from the darkness in the rest of the book. Oh, and Flycatcher's back! That was one of my grumbles with volume 11, so it was nice to have him back...even if he is still clueless about his relationship with Red Riding Hood. Also posted at casual dread. A graphic novel that is rich and dark like the finest chocolate. A story starring the sad-faced detective Fernandez Britten as the "The Heartbreaker", a dectective famed for finding out what you didn't really want to know about those you love. Britten and his diminutive partner, Brulightly, take on the mysterious death of Bernie Kudos. Is his death a suicide or a murder? Lovely Charlotte Maughton wants to find out the truth about the death of her fiancee. As Britten digs deeper he uncovers blackmail and revenge and the startling possibility that to do the right thing one may need to be remain silent. Beautifully drawn, with subtle washes of color, this book is a stunning first effort. I want to see more from Hannah Berry. Or rather the Finnish edition which consists of JLA 16-21 and New Year’s Evil: Prometheus. The US trade seems to also contain JLA 22 and 23. The preview at DC's site seems to have a few pages out of them. The Finnish edition has three stories: one about Prometheus’s quest to destroy JLA, then Julian September and his successful attempt to alter the probabilities of the universe, and lastly Adam Strange kidnaps the JLA and forces them to work for him. The trade starts with Prometheus who is telling his origin story to Retro, an ordinary man who has won a day as member of the JLA. The issue is really an info-dumb about Prometheus but to me, at least, it was rather entertaining. At the end of the issue, Prometheus kills the poor Retro and disguises himself to look like Retro. That’s a fine way to get himself into the Watchtower and to take on the whole JLA. The JLA team itself has grown: in addition to the core team (where Diana’s mother Hippolyta is Wonder Woman) they now have Huntress, Zauriel, Steel, and Plastic Man. Later, Oracle is also revealed to be part of the team. I’m not at all familiar with Steel but since JLA isn’t about characterization, that doesn’t really matter. A group of almost hundred reporters have been invited to the Moon Watchtower to see the next incarnation of JLA. Lois and Clark are among them and J’onn uses his powers to disguise himself as Clark while Superman welcomes the reporters to the Moon. Prometheus as Retro is also teleported to the Moon and he starts this campaign against the JLA with downloading the schematics of the base and cutting off the JLA’s air supply. Impressive! I enjoyed the first story quite a lot. Prometheus is very much an over-the-top comic book villain and he was used very well this time. The combination of reporters and superheroes has always tickled my funny bone for some reason and sure enough, the reporters ask laughable questions ("Any advice for menopausal women, Hippolyta?" add an eye rolling smiley here.) They are also a nice, innocent crowd to threaten. The second story wasn’t quite as enjoyable but still quite good. JLA gets (whether they want them or not) new additions Big Barda and Orion. Since I like established couples, Mr. Miracle and Big Barda are some of my favorites. However, Barda by herself is very impressive, too. Here, she's used a bit too much as a peacemaker between Orion and, well, other people. The story itself is about vanishing people and odd coincidences that start to crop up with alarming frequency. Aquaman, Huntress, and Steel are the first ones to disappear and others follow. Similarly, seven air planes are in trouble at the same time and in close proximity to each other. Seven independent super villains decide to kidnap the president of USA at the same time. The JLA must try to quickly find out what is going on. It also contains possibly one of the most chilling pages ever: Batman is just about to explain what is going on and how it can be fixed, when he vanishes. It also shows clearly, how dependent JLA is on Batman's brains and detective skills. I thought the remaining JLA was a rather arbitrary group and I was a bit disappointed that the first members to vanish were pretty much the newest ones. What's the point of adding them if you aren't going to use them? But otherwise the story was pretty entertaining. The third story felt almost like filler. But I'm not familiar with Adam Strange; in fact this the first time I've seen him. He does seem like an interesting character and I think that he has interesting parallels to John Carter of Barsoom. (From another planet, rises to a hero, and marries a princess.) However, the story wasn't enough to become familiar with him. Here, he has used his Zeta-beam to bring the JLA to Rann. He and the En'Taran slavemasters use collars to keep the JLAers in line and force them to work rebuilding the Rann world in honor of Adam's wife's retun to it. The problem is that she's been dead for a few years and Adam is insane. Overall, the trade has classic JLA action even though it's not exactly the best. After beating back the Adversary, Boy Blue disappears on his own mission back to the Homelands in search of the real Red Riding Hood, his true love. He has taken along some of Fabletown's most magical objects to help him which is just as well in the long run. He fights his way through the back passages and tunnels right to the Adversary and we finally learn their identity. This was so much fun. I won't spoil who the Adversary is but I was a little dissapointed when I got to the big reveal. I need to get back to the Jack of Fables series now I am up to date with Jack's story. The Fable universe is extended with the addition of the Fables from the Arabian worlds. They are living in Bagdad and Sinbad with an array of slaves and advisors comes to meet with the major of Fabletown to see about the two cultures combining their strengths after the Adversary has turned his attention to them. They have brought a genie with them, a piece of ancient and powerful Fable magic which could be deemed an act of war. Luckily Fabletown has their own witch in residence, Frau Totenkinder. After the main series of comics there is also The Ballad of Rodney and Jane. They are both wooden people, Rodey is in the Adversary's army and Jane is a nurse. They meet and quickly fall in love, but have some problems with kissing and certain anatomical issues so they petition to be made human ("meat"). Making their dreams come true comes at a price. I loved the Ballad at the end and am looking forward to reading more about Rodney and Jane who I am sure will pop up in future installments. It was also good to get some new Fable characters and it's good to have a scary Fable on the side of good! Mowgli is off looking for the missing Bigby Wolf in a bid to free Baghera from a cage on the Farm. The problem is Bigby is excellent at hiding himself when he doesn't want to be found and now is definitely one of those times. A wild goose chase ensues leading Mogwli through Russian when he realises the reason the lead goes cold. Bigby is not being recognised by humans because he is using his other allies, the wolves. Luckily for Mowgli he was raised by wolves and knows their language and their ways. There is a mission for Bigby that involves Jacl's beanstalk beans. Wolves are not natural climbers, but he has a mission that needs him to go into the Cloud Kingdoms to pull a massive hit and run on the Adversary. He is just the man/wolf for the job and if he suceeds in his mission he will be able to be reuinted with Snow and his children. My favourite in the series so far as it has some great closure. Bigby and Snow are two of my favourite characters and it was great to advance their story so much. I can't wait to see what trouble their brood get into and I hope Rose Red has a greater part to play in later stories. Billy Blaster: Ice Caves of Pluto by David Orme, illustrated by Peter Richardson, 33pgs, RL: 1.1 ~ My reluctant reader just finished this easy reader graphic novel and to date he hasn't met a Stone Arch book he didn't like. This one is very easy to read and he flew through it. A wonderful, fun science-fiction story Billy and his complaining cohort, Wu Hoo, land on Pluto and find friends buried in the ice below the surface. Billy comes to their rescue only to need Wu Hoo to come to his rescue at the end. Great big, bold, almost (but not quite) anime-like illustrations. Ds loved it and I agree. Good quality plot for the limited number of pages and Wu Hoo's dry sense of humour is a laugh. This series will appeal to boys especially. Billy Blaster: Mind Thief by David Orme, illustrated by Peter Richardson, 33pgs, RL: 2.1 ~ Billy Blaster, superhero, and his trusty but sarcastic sidekick, Wu Hoo are back in full form with this science fiction caper. The evil Wizard of Edo is capturing the minds of intelligent men right out of their bodies and as Billy and Wu Hoo fight this evil they each become next on the list. Wonderful comic book superhero story, especially aimed at boys. The story contains a detailed quality plot that my 9 yo ds was eager to continue reading. This set of graphic novels doesn't intimidate him at all, even though as a struggling reader he needs some help at this reading level. Drawings are a fun not-quite-anime style and Billy's friend Wu Hoo is a laugh with his sarcastic (I'd rather be anywhere but here) humour. There are already many books out in this series, too many to list but plenty to keep a boy reading for quite some time. Another wonderful book published by First Second, this wordless graphic novel is all about friendship, loss and redemption. Robot Dreams is beautifully colored in soft muted tones. We follow this story through a year, watching the seasons change month to month. It starts with Dog putting together a "build it yourself" robot. They watch movies, eat popcorn and spend time together. Due to a foolish mistake they become separated. We follow both their thoughts and dreams through the round of the year and finally to a bittersweet resolution. This is a lovely tale. JLA ran four issues in 2001. However, each issue was as thick as an American trade paperback. I’ve got all four Finnish issues but I can’t just find the first one right now. This second Finnish edition includes the American Dreams trade and a couple of stories highlighting the Green Lantern and the Martian Manhunter who aren't known pretty much at all here.